Isaac Murphy was an African American jockey during the 19th century and is one of the greatest jockeys of all time. The three-time Kentucky Derby winner had a 44% winning rate in races, but his life is still one that's little known. Isaac Murphy, the first jockey to win the Kentucky Derby three times, is finally getting the recognition he deserves, thanks in large part to research by Emory's Pellom McDaniels III. The son of slaves who rose to become one of the most successful jockeys in horse racing history, Murphy had largely faded from view until McDaniels published the biography "The Prince of Jockeys: The Life of Isaac Burns Murphy" in 2013. Now the city of Lexington, Kentucky, is honoring Murphy with a week-long series of events including the unveiling of a new headstone for his grave at the Kentucky Horse Park, theater performances, the dedication of a monument to the Murphy family, and talks by McDaniels about his research. 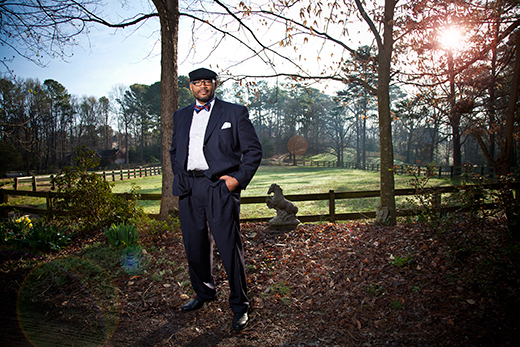 "I would like to believe that my research on Murphy and the Lexington community has served as a catalyst to bring people together to rediscover their collective history," says McDaniels, curator for African American Collections for Emory's Stuart A. Rose Manuscript, Archives and Rare Book Library. McDaniels, who develops traveling exhibitions based on the African American collections from the Rose Library, is an advocate for the power of public scholarship to educate and inspire those who come in contact with his work. "The biography has generated an incredible amount of enthusiasm for revisiting Isaac Murphy's life and thinking about him as one of their local heroes, someone who came from Lexington who had a tremendous impact on history," he says. 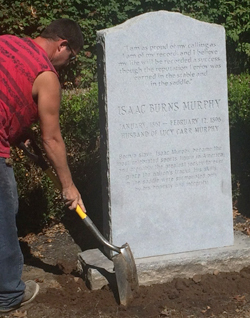 Workers install the new headstone for Isaac Murphy at Kentucky Horse Park. The marker will be dedicated Oct. 22. As a graduate student at Emory, McDaniels began researching Murphy and realized very little information could be found about the jockey — despite the fact that Murphy's win record of 44 percent across all races remains the most successful in the history of horse racing. McDaniels traveled extensively to Kentucky, Virginia, Missouri and other states to document Murphy's life and contributions. Born in 1861, Murphy was a hero in horse racing and a key figure in Lexington's African American middle class community, lauded by black and white fans alike. But Murphy died in obscurity in 1896, after white jockeys and owners, supported by Jim Crow laws and exclusionary practices, colluded to force African American jockeys out of the sport. He was buried in Lexington's African Cemetery No. 2. More than 50 years later, his body was moved to the Kentucky Horse Park, a gesture that McDaniels argues was not necessarily agreeable with the African American community. "In 1967, Murphy's body was exhumed and reburied at the Kentucky Horse Park, a controversial decision, considering the fact that the Kentucky Club Tobacco Company sponsored the creation of the monument with the approval of a committee that was comprised of Judge Joe Johnson, Mayor Fred Fugazzi and Hall of Fame jockey Eddie Arcaro. The decision was not discussed with the leaders of Lexington's African American community," McDaniels notes. As part of the week of events "Celebrating Isaac Murphy," set for Oct. 19-24, the horse park will unveil a new headstone for Murphy with tributes to him and other African American jockeys. Both the mayor of Lexington and the governor of Kentucky are expected to be in attendance. Later in the week, the cemetery where Murphy was first buried will dedicate a Murphy Family Memorial at his former gravesite. Other events include a public talk by McDaniels on Oct. 20, the installation of panels about Murphy and African American jockeys at the Isaac Murphy Memorial Art Garden, and performances of a play about Murphy — "I Dedicate This Ride" — at the Lyric Theatre. The Lyric Theatre Gallery also features an exhibit about Murphy with photographs, illustrations and texts curated by McDaniels. The "Prince of Jockeys: The Life of Isaac Burns Murphy" exhibit, which started traveling in 2013 and has already been on view at the Kentucky Derby Museum in Louisville, Kentucky, continues to educate a range of people from all walks of life. In Lexington, the exhibit will be on view through Dec. 11. "The fact that this history has always been with the people of Kentucky, especially Lexington, and the fact that I was able to help them revisit this in a way that has helped them come together is important," McDaniels says. McDaniels' research challenges stereotypes about African American athletic achievements. "In my work as a sports historian and curator of African American Collections in the Rose Library, I examine how African American men have attempted to prove their humanity, manhood and citizenship through sports performances," he explains. "While there are clear examples of high profile athletes claiming all the rights and privileges available to them based on their success in the arena, on the field and court, and on the race track, African Americans as a whole have been able to live vicariously through the success of their cultural heroes." His perspective on sports is informed by his scholarship as well as his own experience as an elite athlete. Before beginning his academic career, he played football for nine years in the NFL, first with the Kansas City Chiefs and then with the Atlanta Falcons. In his research on Murphy, McDaniels sought not only to remind readers of Murphy's achievements, but also to explore his accomplishments in the context of the complex and shifting ideas about race, class and culture during his lifetime. "Part of the project was to humanize him, to demystify this idea of his natural God-given ability, and to show that his success as a jockey came from not only being born during a particular time period where horse racing was the industry in Lexington, but also the number of opportunities he really had to pursue other occupations," McDaniels says. "If we use Murphy as a model, we can show children who are growing up in uncertain conditions the necessity of maintaining a strong character in the face of adversity," he concludes. "What is more, we can demonstrate to the various communities, the importance of believing that we all are responsible for raising and shaping the future success of our children. It does take a village."